Little E snuck a toy car into his crib with him when I put him down for a nap this afternoon. About twenty minutes into his nap, I heard him screaming. This is pretty unusual for nap time, so I ran upstairs to see what the ruckus was about. His car had fallen out the back of the crib and was lodged between the crib and the wall. This kid was mad and this mommy needed him to be sleeping. So I laid down on the floor and stretched my long-a** arms under his crib to try and retrieve his car. In the process, I pulled a muscle in my neck. I'm not being dramatic here. I can barely turn my head from side to side. 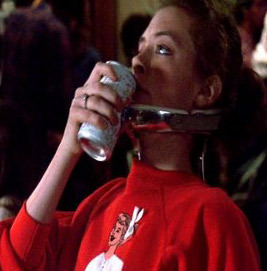 I'm like Joan Cusack in her 16 Candles appearance. I am H-U-R-T-I-N-G. I curled up next to his crib. My neck was throbbing. To add insult to injury, I banged my head on a toy train also lurking near the crib. Ouch. Little E continued his screaming tirade. I had to reach this stupid car if it was the last thing I ever did. I repositioned myself on my belly and stretched under the crib again. This time I got it. I tossed the car back into the crib. Little E smiled at me. I tried to be mad at him, but I couldn't. I'm off to rummage through the medicine cabinet in the hopes we've got something strong enough here to numb my neck pain. Percocet, anyone? Also, who do I talk to about getting injured on the job? Mr. Yoy? Except I won't be drinking beer. Make mine a white zinfandel. Yes, I said it.